Tennis ball launcher dog toys have been around for quite some time now. I was shocked to find out how many different kinds there are. We chose the Hyper Fling, made by Hyper Pet, mainly because it has a collapsible handle. We had a hard time picturing ourselves lugging around one of those gangly neon ones. The Hyper Fling just seemed to fit our lifestyle better. It’s less than 11 inches when the handle is collapsed, so it can easily fit in a small bag or backpack. 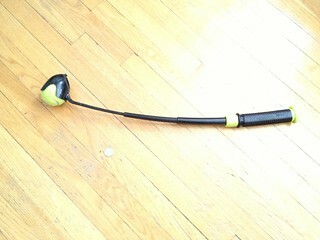 The Hyper Fling performs well, launching the ball farther than we could throw it ourselves. It is also very easy to pick up the ball. We definitely don’t miss picking up the slobbery tennis ball with our bare hands. The unfortunate thing about this product is that its most desirable feature may be the reason why it won’t last very long. The handle has already started to stick when we try to collapse it. I’m not sure how much longer it will work, but at least it won’t be completely useless. Much like an escalator, it can’t really break. It will just eventually become like the other tennis ball launchers1.